Burke has published this reference to John Gregson of Murton in his MANY books on heraldry. "The British herald, or Cabinet of armorial bearings of the nobility & gentry of Great Britain and Ireland. Vol 1 By Thomas Robson (engraver.). 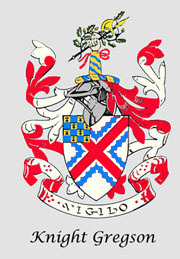 Published 1 January 1830"
The arms here mentioned reflect both Gregson and Allgood. But it is the words "originally from Derby" which took my interest. John is a direct descendant of Richard the son of John of Murton (d 1607). Could this mean his direct ancestor John Gregson of Murton 1607 hails originally from Derbyshire? Of course, I am not ignoring that he went from Barton Upon Humber in Lincolnshire to Murton in Co Durham. But we do not know where he was born! Interesting. Here is a branch of the Gregson family which refers to Gregsons of Derbyshire. Is this a possible connection??? Having studied the Gregson Pedigree of Derbyshire in the online book Familiae Minorum Gentium vol 1 (on archive.org) p.216, Thomas Gregson who married Alicia Merry (c1560 according to Reid who wrote the booklet entitled the "History of the Gregsons of Whalley p18) had brothers named John, William and Gregory. Thomas is said to have died in the 38th year of the reign of Elizabeth I namely 1596. John of Murton died in 1607 - a similar period. However, information which makes one wary of this link is that whereas John's eldest son was 50 when he died the Pedigree named above states that Henricus, son of Thomas, was only 12 when his father died. However, he could have been the youngest of his six siblings.